Remember to measure your pet for the paw-fect fit. Pets stay warm and cozy when they slip on the Pet Life Lightweight Sporty Avalanche Dog Coat. This fashionable coat is made just for pups, with high-quality materials that protect them from biting cold winds. It’s windproof and keeps pets extra toasty with special 3M Thinsulate Thermal Heat Retention Technology, which adds a layer of warmth with a thin, insulating shell tucked inside dual-sided polyester fabric. Your tail-wagging pal will be extra comfy in this lightweight coat that slips on and off easily with a fuzzy fastener closure that attaches at the belly. Adjustable straps along the back give the perfect fit, and there’s a hole for leash attachment at the back of the neck. The concealed hood can pop out of the collar when needed. There’s even a storage bag with a handle for easy carrying. The Lightweight Sporty Avalanche Dog Coat comes in tons of sizes and colors to suit any dog’s personality. Attached concealed hood actually pops out of the collar, and conveniently tucks away when not in use. This is the perfect little jacket. It's just like a human parka. It's very light weight (like a pillow) and has Velcro along the chest closure. It closes across his tummy so it stays warm. It's very cute and he knows how we put it on. It actually has sleeves and a front so the belly stays warm. Overall the jacket isn't bad, it really isn't near as warm as we had hoped for. We have two very cold natured dogs and have to put two things...a sweater and a coat on when it gets down to 50 or less. Our winters can go into single digits at times and was looking for a thicker coat for them. I ordered a pink one for my 45lb mix breed, Peaches. It's a really nice coat and keeps her very warm. A cpl people told me she looks like a pink marshmallow. Wanted a jacket for my springer spaniel that completely covered his chest. 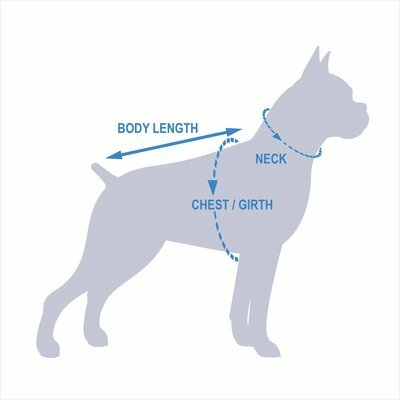 Regular dog jackets have a flap that goes around the neck and another flap that goes around the belly, leaving the chest area unprotected. This jacket is much warmer. I watched the Chewy video on how to measure your pet for a coat, they say to add 2 inches to each measurement so I did; ordered the Small for my 7lb chihuahua but it was way too big. Chewy customer service were great and they are sending an X-Small to us. The coat is stored in a very practical little bag made of the same fabric; the coat itself is very light and toasty warm. The finish is so-so (I had to cut a lot of hanging threads off of it) and the velcro closure is not the sturdiest, you really have to press it in pretty firmly to attach it. I may get a tailor to add on a couple of snap closures if it doesn't stay closed. Patagonia for my dog - maybe Petagonia! Nice weight. Cinches in back to tighten the fit. My dog is a fair weather dog, and he'll stay out longer when he's wearing it so I have to assume it keeps him warm. Thank you, Kyleigh S, for your help with this. I LOVE this coat, perfect for chilly days with wet snow! Plus the colors are bold and awesome! I am obsessed with my dog in this coat!! Sizing is correct! Ordered an XL for my pitty/puggle mix. She's a medium size dog, 33 lbs. some lose strings I had to cut off myself but should be sturdy enough just for going out n playing in the snow. Love it! hmm...I paid $5 for this coat one year ago. This coat was a steal a year ago, but it's definitely not worth the current price as it's not insulated or anything. I like to put it on my dog as the bright orange color is protective in the fall, but for some reason my dog does not enjoy wearing this coat. After a year of wear, it does have some fraying on the velcro. If the price drops again, I'd recommend it. In a good way! This is not the sturdiest, well made jacket (has some loose threads, the little cinching tabs don't hold the elastic around the "waist" the best), but I think I paid less than $6 for it, so that is a great deal. I ordered a small for my ~13 pound min-pin/doxie mix who has kind of weird proportions (I had previously ordered an xsmall which was a bit tight on him, and he chewed it up, so we went for a roomier fit this time). Overall though, I love this jacket. It's so cute and keeps him warmer during our Pacific Northwest fall/winter times!